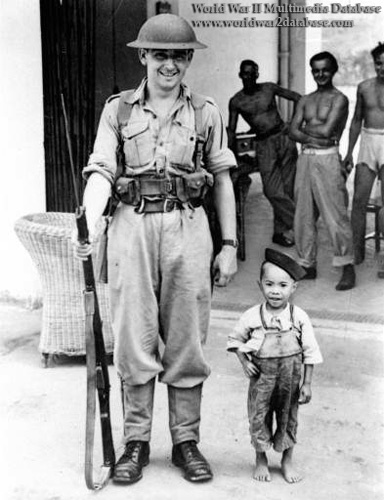 Propaganda photo of Chinese boy and British soldier of the 150th Infantry Brigade, emphasizing the positive aspects of colonial rule. The reoccupation of Hong Kong was marked by confusion and tension between China and Britain. US President Franklin Roosevelt recommended that Hong Kong be administered after the war by Chinese Nationalist Kuomingtang. Britain intended to hold onto the colony, and in defiance of Supreme Command Allied Powers' orders to not hold separate surrender ceremonies, a British Fleet under Royal Navy Rear Admiral Cecil Harcourt headed for Hong Kong, with the tacit approval of the new Truman administration, to support the declared administration of Colonial Secretary Franklin Charles Gimson. They arrived on August 30, 1945, finding a colony where triad gongs competed for loot in the disorganized and leaderless colony. Harcourt did not have the soldiers to restore order, so Gimson played one triad off of another, arming and deputizing some to suppress another. By October 1945 the 150th Territorial Brigade arrived, forcing the triads into cooperation with the colonial government, and allowing Gimson to marginalize with the Kuomintang guerillas in the Kowloon area. Despite legitimate claims to Hong Kong, Kuomintang Generalissimo Chiang Kai Shek declined to confront the British. The United Kingdom retained control until 1997.